These Zero Friction Performance golf tees are designed to give you more distance because there is less resistance than you encounter using a traditional tee. This tee has 3 prongs which hold the ball up. 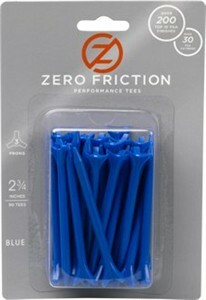 These Zero Friction tees are pretty inexpensive and, all kidding aside, you may get a few extra yards with them. I prefer the Epoch tees, which are actually used on the PGA Tour. However, I am a bit of a purist and a skeptic; thus, I say stick with your old tees, worry less about the few extra yards you will get, and work on your short game.